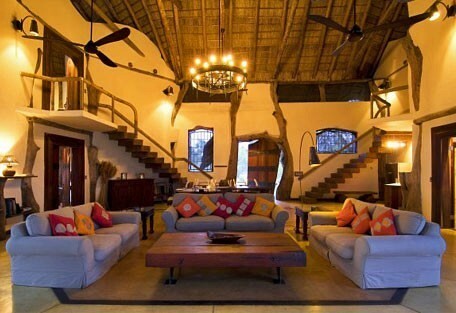 Luangwa Safari House is a stunning private house is situated on Robin Pope’s Nkwali land, approximately 1 km from camp. The super structure of the house is twenty five ancient and weathered leadwood trees – powerful and natural. The entrance side of the house is grand, castlesque and is exquisitely faced with stones from the hills. The massive door opens into the huge main room and instantly you see incredible views through the front of the house – which is completely open. Each of the four bedrooms has a style of its own. Extra large beds, both king size or twin fit into each room under one mosquito net. There is a wooden ceiling fan inside each net. The beds have all been designed differently, from two poster beds to beds suspended by chains from the roof. The materials used in the bedrooms are hand painted and specifically designed, made locally at Tribal Textiles. Each bathroom has a different theme for the fittings, reflecting the colours of the rooms. From copper for the “Coral room” (including a hand made copper bath) to recycled sandblasted aluminum in the “Blue Agate” bedroom. These fittings have been matched with unusual pieces of Zambian marble hand picked by Jo and Robin. The open front of the room leads out onto a quartz tiled terrace with large plunge pool to one side. From this terrace a magnificent risen walkway leads to a wooden deck surrounding a small group of huge ebony trees in the middle of the lagoon. There is a large leather sofa, and a hanging chair plus dining table and chairs for al fresco meals. From here the waterhole is nearby, and sitting quietly you will be close to families of elephant that come to bathe. Owned and run by Robin Pope Safaris, Luangwa House is barely five minutes’ drive from its sister camps, Nkwali and Robin’s House. Luangwa Safari House was designed by Neil Rocher, who also designed the flowing curves of Chongwe River House, and clearly part of the brief was to make a house where, during the day, you didn’t feel enclosed. Thus lots of the walls open up completely – to leave bedrooms and a main area which are almost entirely open on one side. 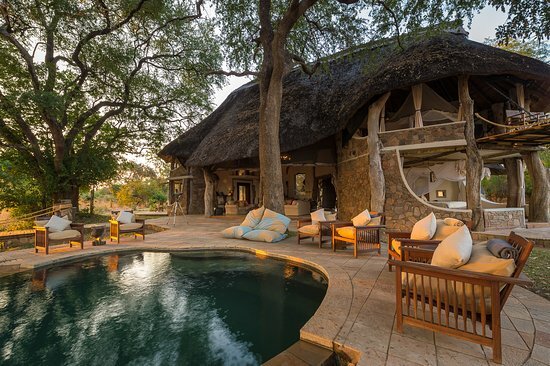 Built with stone walls and a thatched roof, Luangwa Safari House is entered through an enormous, sturdy door at the back. This opens into the atrium-style dining and lounge areas. Large sofas scattered with colourful cushions look very inviting, but when we last visited in June 2017, it was the expansive view that drew us through the lounge to the open deck in front, where we just had to stop and admire the elephants, puku and warthogs scattered around the almost-dry lagoon. There is a small pool, and a shaded wooden walkway leads to a small deck that extends further out to the lagoon. A hide, cleverly created from a shipping container and sunk into the ground, allows you incredible views of the elephants visiting the water. - Private vehicles, guides and armed scout for walking safari. Canoes and boat at Chongwe.